The English language is a funny thing. Even as technology radically changes the way we go about our daily lives, we still find ourselves using many of the same old turns of phrase. For example, we might text friends the 16th century expression “it’s raining cats and dogs,” or say that 3D movie tickets cost “an arm and a leg.” Considering how confusing these old sayings might be to newcomers, why do we still bother with them at all? Why don’t we, instead, just say what we mean? Perhaps that just isn’t poetic enough. Indeed, our human fondness for all things abstract might help explain why so many idioms come from the art world. From music and literature to paintings and dance, the arts have given birth to many famous phrases. Here are eight of the most popular examples of art’s lasting influence on the English language. Origin: This idiom traces its roots all the way back to ye olde English. “Fell” (an old word, which came into use by the 13th century) is the common root of “felon”. But the full phrase, “at one fell swoop,” comes from the King of Timeless Expressions himself, William Shakespeare. What better way to portray Macbeth’s deadliness than by comparing him to a ruthless hunter? And with that, “warts and all” was born. On the surface, the phrase evokes ugliness. But there’s also something beautiful about the idea of a divisive, incredibly powerful historical figure insisting on humility. Origin: Many people think that mouthwash brand Listerine coined this phrase. 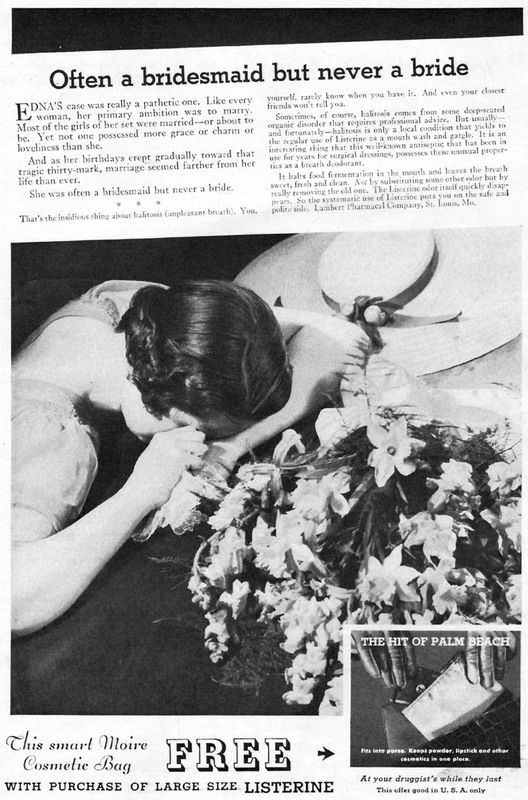 Beginning in 1925, the brand ran print advertisements featuring “Edna”, who was “often a bridesmaid but never a bride,” because she didn’t use Listerine to combat bad breath. True, Listerine pushed this phrase into common parlance, but its first usage in popular culture is from the 1917 Victorian music hall tune, “Why Am I Always the Bridesmaid,” by composers Charles Collins and Fred Leigh. Conspicuously absent in the lyrics: any mention of the protagonist’s oral hygiene. Origin: In the 16th century, the musical term “stop” meant “note” or “key.” But before long, language evolved, and “stops” started referring to handles on pipe organs, which are used to control the airflow through the pipes. “Pulling them out” increases their volume. Today, we understand that “pulling out all the stops” means to make every last effort — no knowledge of the inner workings of organs, required. A close-up look at the stops on an electronic organ. Origin: This phrase originated in the early 1900s. And, according to Eric Partridge’s Dictionary of Catchphrases, it’s a translation from German. The term “Hals und Beinbuch” (a broken neck and a broken leg) was commonly used by German actors before performances. It wasn’t long before their British and American counterparts caught on. Origin: “Piece of cake” refers to the cakewalk, a couples’ dance invented by African Americans in the late 19th century. In its earliest form, the cakewalk was performed by black slaves, who danced competitively for of their masters. Couples formed a square, with the men on the inside, then strutted around inside the square. One by one, couples were eliminated by judges. In 1876, the dance was performed at the Centennial Exhibition in Philadelphia, where the winning pair was presented with a prize piece of cake—hence, the name. Soon, the cakewalk began to spread across the U.S., where it was performed in minstrel shows and ballrooms alike. 1898 saw the premiere of Clorindy, or the Origin of the Cakewalk—the first Broadway musical to feature an entirely African American cast. And even though the dance could be hard work, dancers made it look light-hearted and easy. Today, the terms “piece of cake” and “cakewalk” have both become synonymous with simplicity. The Kelly and the O’Kellys failed commercially (it sold only 140 copies), but the idiom it produced has been a lasting success. But this wasn’t Trollope’s only contribution to our lexicon. The first printed citation of the idiom “blow your own trumpet” (i.e. to boast, or “toot one’s own horn”) was found in Trollope’s 1873 work, Australia and New Zealand. He wrote, “In the colonies . . . when a gentleman sounds his own trumpet, he blows.” In this context, “blows” mirrors its current, somewhat crass use in American slang — a subtle reminder that boasting isn’t a good look. So, if you’re wondering what the idioms of the future might be, look no further than the art of today.